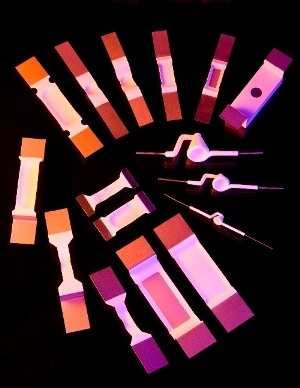 Alumina coated evaporation sources have been developed to replace alumina crucibles for some specific applications. The advantages of this type of evaporation source is good heat transfer and the inertness of alumina with most metals. Also, the evaporant does not wet the alumina resulting in no resistant change of the boat when the evaporant melts. Due to the non wetting characteristics of alumina, the evaporant forms a sphere when melted resulting in a point source. This type of evaporation source will give long life compared to the non protected sources. Coated sources will require from thirty to fifty percent more power to effect an evaporation do to the difference in heat conduction. The alumina is semi-conductor grade and is applied to the boat or basket by a plasma spray technique. Temperatures of 1850 degrees C should be avoided, and when an evaporation is effected the power should be reduced slightly to avoid over heating.